What’s the Best Way to Experience New York City’s Broadway? On Foot! When the name Broadway is spoken, it’s likely that any tourist immediately thinks of theatre — finding tickets to a showing of Wicked or Phantom of the Opera. But, New York City’s Broadway Street is more than a theatre district. It’s a 13.5-mile street that runs the entire length of Manhattan Island. And, by accepting the challenge of walking this street, you’ll not only stroll through the theatre district, but you’ll also have the chance to explore Wall Street, the World Trade Center, Times Square and St. John the Divine Church, among others. So pack your walking shoes, and be sure to take this list of sites to see along Broadway. You’ll need to get an early start if you decide to make this a one-day adventure, so grab a cup of coffee and a fresh bagel and head to Battery Park, located on the southern tip of Manhattan island. From this park, you’ll be able to view the Statue of Liberty as well as check out Hope Garden, a memorial to AIDS victims. From the park, you’ll head north on Broadway. 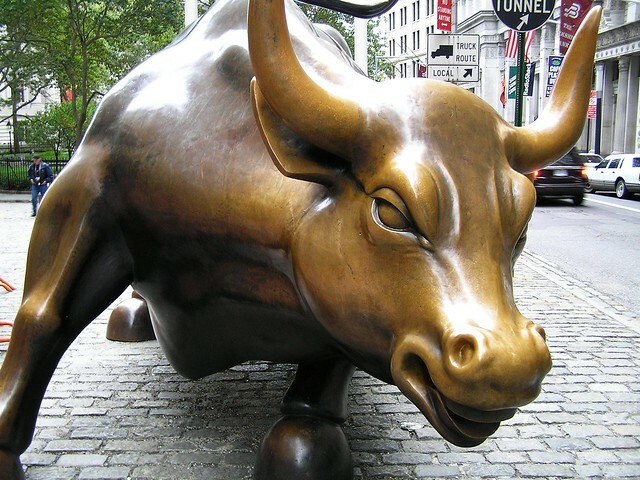 One of the next landmarks you’ll encounter is the Wall Street Charging Bull sculpture, located in the financial district. The bull was sculpted by Arturo Di Modica, who wanted to celebrate the can-do spirit of America and particularly of New York. It was completed in 1989. The World Trade Center and the 9/11 Memorial and Museum are just one block off Broadway on Vesey Street. The museum opened in May 2014 and is an educational and historical institution honouring the victims and examining 9/11 and its continued global significance through artefacts and records. You’ll also make your way past the campus of New York University. NYU was founded in 1831 and is the largest private university in the United States. It is composed of 14 schools, colleges, and divisions and occupies five major centres in Manhattan. So, if picking up an NYU T-shirt from the campus bookstore is on your list, you’ll find the university a block off of Broadway at West Houston Street. As you continue up Broadway, you’ll encounter Union Square and will either have to walk around or through it before meeting up with Broadway again. The square is known for its impressive equestrian statue of U.S. President George Washington, which was unveiled in 1856. 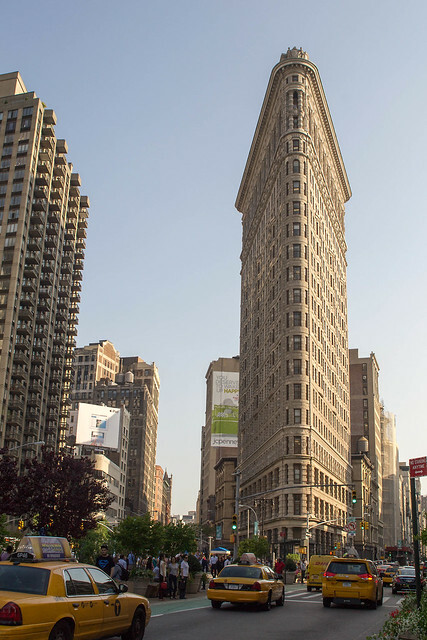 The Flatiron Building at Broadway and Fifth Avenue was built in 1902 to take advantage of an odd-shaped piece of real estate. Amazingly, it’s only six feet at the prow and yet, 20 stories tall. At 33rd Street, you can take a walk one block to your right to visit the iconic Empire State Building, the 103-story skyscraper in midtown Manhattan. Or, you can turn left at 33rd Street to visit to Madison Square Garden and Penn Station. You won’t be able to miss Times Square when you hit 7th Avenue. This famous section of Manhattan is lit up around the clock and is home to shopping, theatres, eateries as well as the New Year’s Eve ball drop and the studios for ABC television’s Good Morning America talk show. Almost everyone that travels to New York has to spend at least a few hours here. As you continue navigating up Broadway, at West 53rd, you’ll find the Ed Sullivan Theater, which is home to the Late Show with David Letterman. This 13-story theatre first opened its doors in 1927. After walking around Columbus Circle, at West 65th Street, you’ll meet up with the Lincoln Center for Performing Arts (the world’s leading presenter of superb artistic programming, a national leader in arts and education and community relations and the manager of the Lincoln Center campus); the Julliard School for dance, drama and music; and the Metropolitan Opera. At West 114th Street, you’ll walk upon another university campus — this time the Ivy League’s Columbia University. This university was founded in 1754 as King's College by royal charter of King George II of England. It is the oldest institution of higher learning in the state of New York and the fifth oldest in the United States. Trinity Cemetery is located at Broadway and West 153rd Street in Harlem. The cemetery overlooks the Hudson River from upper Riverside Drive and is home to giant hundred-year-old oaks and elms. This is the only remaining active cemetery in Manhattan and is home to the gravesites of John James Audubon, Alfred Tennyson Dickens and John Jacob Astor. As you continue exploring Broadway on foot, you’ll complete this adventure at 225th Street, before crossing into the Bronx on Broadway Bridge. And, if you decide this adventure is a bit much for a one-day excursion, divide it up, and conquer Broadway over multiple days during your New York trip to gain a true feel for this iconic American city.